Though they’d prove to be influential, the first three issues of MAD didn’t sell well. EC lost thousands of dollars off the issues and the 350,000 copy print runs didn’t sell out — or even enough to break even. (Nowadays, a hit comic sells around 40,000 copies.) But that all changed with MAD #4, the first issue to sell out and put MAD in the public eye. It also brought the first hint of legal trouble from an unhappy satirical target. MAD #4 opens with, after the letters column, with “Superduperman!,” MAD‘s first direct parody of another comic. And “Superduperman!” was responsible for both the popularity and the threat of legal trouble, when the folks at DC Comics weren’t exactly thrilled with the story. Though it never went to the threatened lawsuit — most likely because DC would have lost, especially as Kurtzman discovered legal precedent supporting EC — Bill Gaines and Harvey Kurtzman were advised by their lawyers (who also represented DC, it should be mentioned) to stop with the parodies. Thankfully, they didn’t listen. “Superduperman” is what happens when MAD is firing on all cylinders. 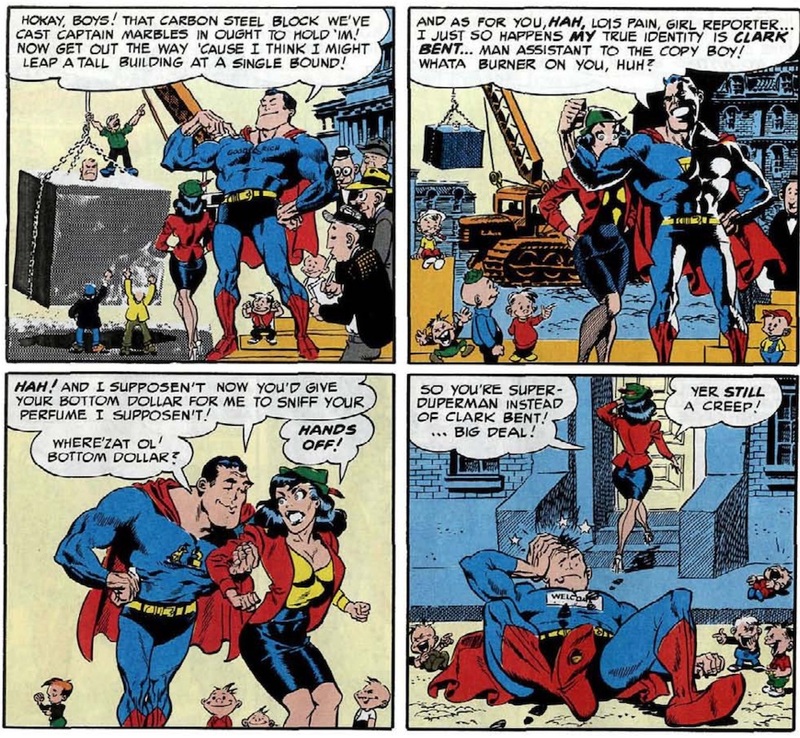 Kurtzman’s story works on its own, without knowing the particulars of the Superman/Captain Marvel fight. 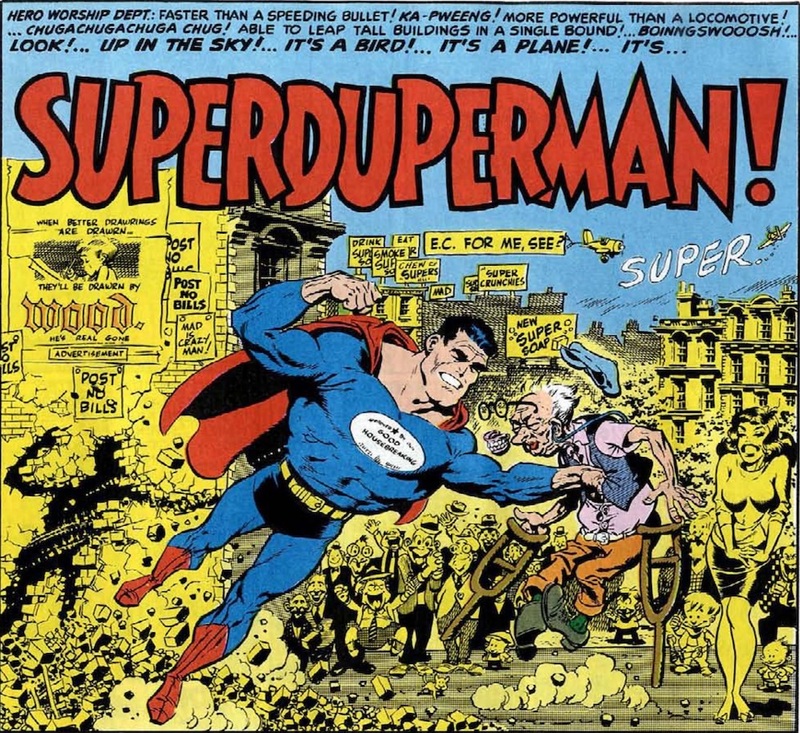 Kurtzman sets up his characters well, without requiring the reader to know anything about the original Superman, and his story is expertly told. And, of course, Wally Wood’s art in this one is truly amazing; packed with detail, background gags and beautiful art. Truly, when better drawings are drawrn, they’ll be drawrn by Wood. 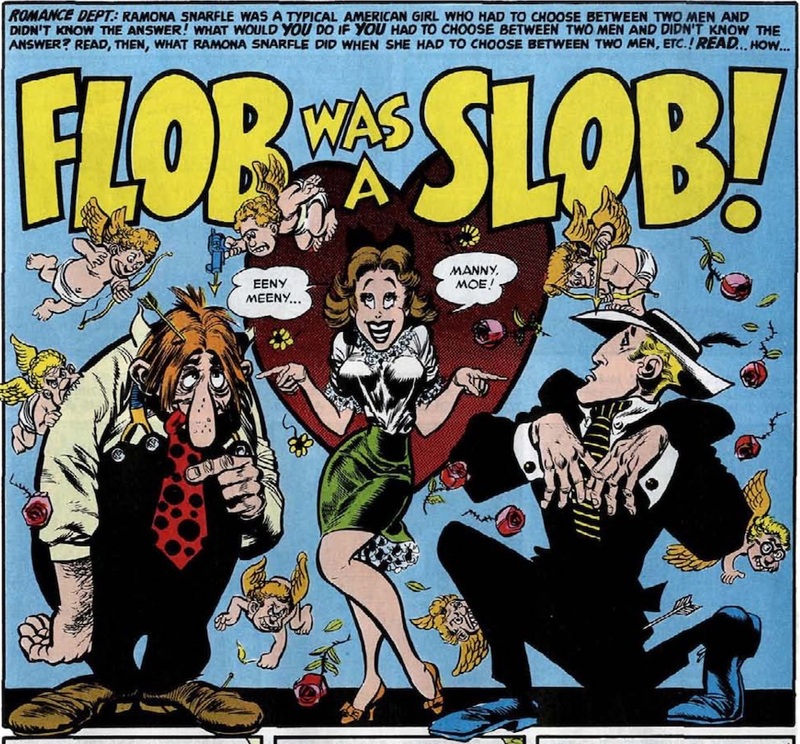 After “Superduperman!” we get another look at romance — “Flob Was a Slob!” While “Flob” isn’t a direct parody of a specific comic, it riffs on a common genre of romance comic, where the narrator is a woman telling about how she threw away the kind soul for the physically attractive jerk who inevitably leads her to a life of crime. The story opens with Ramona Snarfle giving her tear-stained true confession to a group of children, no doubt her charges as a kindly teacher. She tells how her boyfriend, Sheldon Flob would take her out on picnics every week and he’d go butterfly hunting. But one day, she meets up with Rackstraw Him, a blond beefcake in a suit. Even though Rackstraw is rough — including slapping her a few times and mashing Sheldon’s butterfly — she falls for him. But she soon realizes things aren’t what they seem as he takes her along to sell reefer to schoolchildren and rob banks. Thankfully, Flob’s been there all along and takes her back… but, of course, she realizes that she wants more than mashed butterflies, and it’s revealed the children she’s been tearfully telling her story to are actually customers. She’s back with Rackstraw, selling reefer to kids. I love a happy ending. Again, while “Flob” isn’t a direct parody, it benefits via the specificity of this particular kind of cliched romance comic. Jack Davis’ art is outstanding as always; Sheldon is drawn with a bulbous, Kilroy-esque nose that Rackstraw is constantly smacking around. Flob appears in almost every panel, including those that don’t mention him (more shades of Kilroy), and comes off as a goony simpleton. Yes, Flob is sweet, but you get the impression there’s nothing going on inside his head other than butterflies and Ramona. Ramona’s not exactly better off with Rackstraw, but a life with Flob would be stultifying. Next is another check-in with Cosmo McMoon, only this time McMoon is answering letters sent in by “readers.” Even freed from having to make a coherent story, the McMoon piece is anemic. The letters are too long and meandering, and Cosmo’s responses are too brief. They’re intended to be pithy, but aren’t. The best one is a letter about a dyslexic skywriter; Cosmo points out that the letter writer, Oxo Radar, will have no trouble with his own name. Hi-larity. While John Severin’s outing in MAD #3 was overall the weakest part of a weak issue, Severin’s back to form on “Robin Hood!” While “Robin Hood!” is still one of the weaker stories in MAD #4, it’s more to do with the fact that the rest of the issue is so strong. The story is slight, and Robin Hood is a secondary character in his namesake story, but it works. The story opens with Big John and Sparkie, two down-on-their-luck minstrels, watching the Sheriff of Nottingham coming back on tax collection. They’ve heard of Robin Hood who steals from the rich and gives to the poor, and seeing as they fit into the latter category, hope Robin Hood can help. 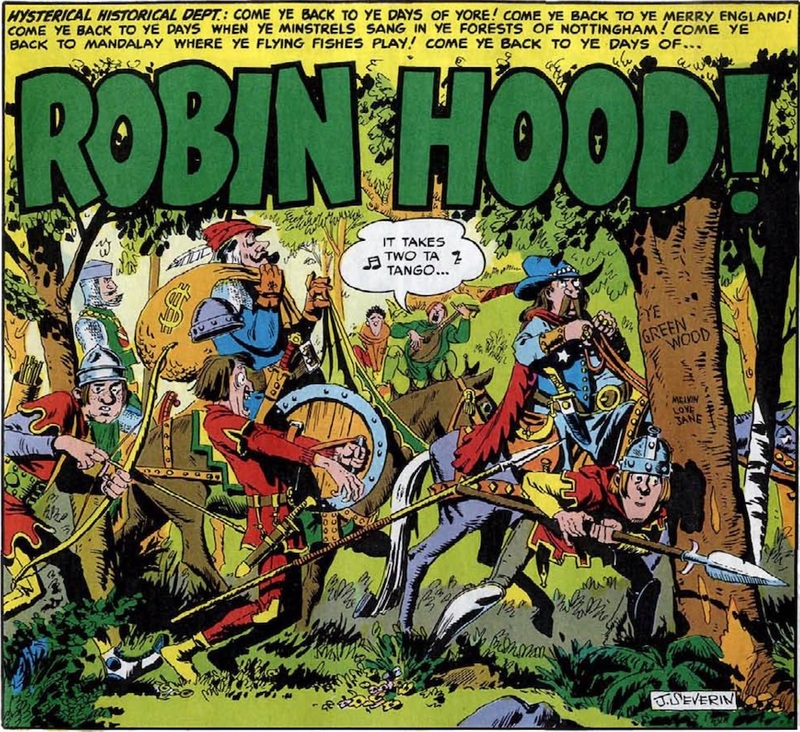 The two come across Robin Hood and his merry men, who energized by the thought of all that money take John and Sparkie’s advice and rob the Sheriff. But instead of redistributing that wealth, the band of merry men shakedown John and Sparkie for the little they have. Though the story is thin, it’s a good joke, and Severin puts a lot of time and effort into his art, unlike his story last issue. The forest is lush, and the characters have more expression. While it could probably be knocked down from six pages to three or four, it’s not bad. 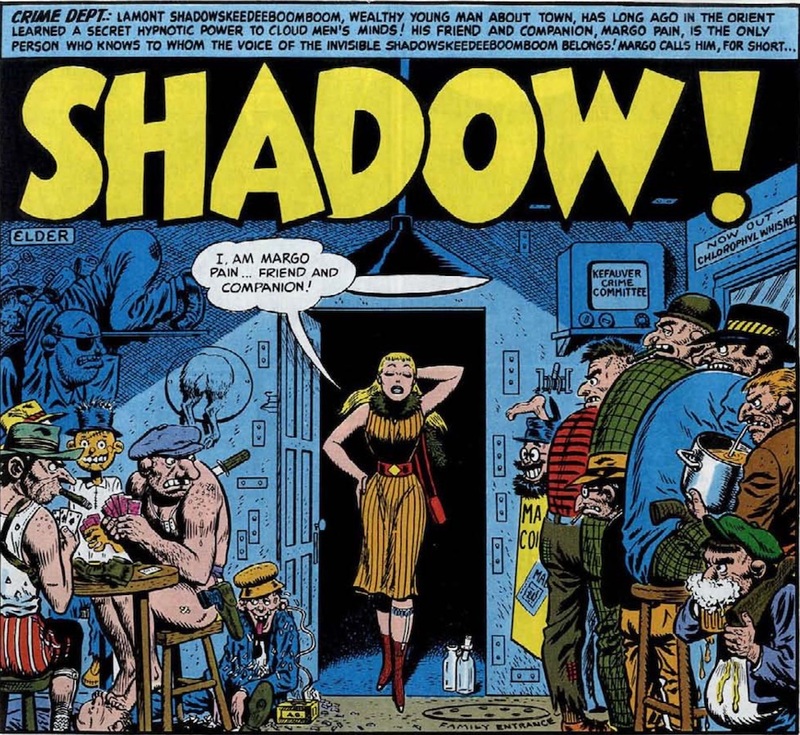 While, like “Robin Hood!” the story of “Shadow!” is slim, “Shadow!” is packed with more gags, and unlike “Dragged Net!” from the last issue, though the story’s gags are mostly set pieces, they flow much better than in that story, which just left me scratching my head more often than laughing. Where the seven-pager itself only really kicks into gear in the last couple pages, it works. Each of the set pieces is given a page, aside from the opening shootout, which gets two, which makes “Shadow!” perfect for browsing. While “Superduperman!” is the strongest story, “Shadow!” is a good choice for the cover, as comics rack browsers could flip to this story and read a page or two and get a feel for the type of humor in the entire book. It’s obvious why MAD #4 was the breakout issue — and next time, we’ll see if the trend continues.